The bumper sticker "Life's a beach!" must have been created for Anguilla. Thirty or more of the world's most gorgeous beaches—long crescents of soft white sand—encircle this three-by-sixteen-mile-long island in the Leewards. Except for these lustrous stretches, most either deserted or barely developed, the island is barren and not particularly scenic, and its history and culture seem unremarkable. So it's not surprising that this scruffy, low-lying island five miles north of St. Martin didn't begin to attract visitors until the mid-1980s. 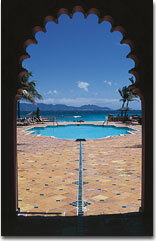 Once Anguilla began to develop, however, it did so with panache. Some of the Caribbean's finest dining and most dramatic, ultra-luxury resorts grace these pristine shores. To some, the fact that low-key Anguilla's only features are these chic hostelries and drop-dead gorgeous beaches may seem a shortcoming. But these "shortcomings" are exactly what makes Anguilla appealing to a growing cadre of sybarites who revel in the islannd's very simple pleasures.